As I walked through the sand, hand in hand with my wife, I noticed my feet turning black – like I had stepped through piles of ash after remnants of a roaring wild fire. The sand itself was unlike those of other Caribbean beaches that I had walked, the color and texture being somewhat strange. Looking to my left while walking, rock formations jutted out, in front of the hill side where our hotel resort was perched. The rocks looked blacker than the sand: as I learned later, the result of thousands of years of volcanic ash and lava covering the rocks and forever changing their appearance. Some of the names are Poas, Irazu, Turrialba, Rincon de la Vieja, and lastly, Arenal – widely known as one of the most beautiful volcano sites on earth. Costa Rica is much more than volcanoes, though. Its topography includes lakes, mountain ranges, jungle terrain, tranquil bays, and the Pacific Ocean. Luckily for us, five star resorts are plentiful as well. My wife and I were lucky enough to walk this stunning beach, in its bay encased setting with an appropriately hot sun, through a Diamond Club incentive sponsored by the company that I work for. I say lucky – but more than a couple of people that would say that luck is secondary to the hard work and dedication that it takes to become a Diamond Club winner. We’re lucky because the two of us absolutely love to travel, and the company gives us ample opportunity to do it on their dime. We would travel anyway, even without the multiple wins that I have – for example, taking the kids on a family vacation last year to the Dominican Republic that was just as sun drenched and breathtaking. The label not only gives a nod to my sci-fi movie loving past, but reminds me how lucky (there’s that word again) we are to live the life that we do, mostly when we want to do it. I called it luck as I don’t believe any of what we experience is possible without the fantastic voyage that came before us. Previous readers of articles here know where I’m coming from. Our trips, no matter how exceptionally amazing and satisfying, can’t compare to the importance of that one trip that my family made to come to America – my grandfather’s side coming from Calabria in Southern Italy, my grandmother’s traveling from a small town in Sicily. While our accommodations were five star with great food, wine, and swimming pools complete with spa appointments, my immigrant family enjoyed no such luxuries. Traveling on cramped ships in steerage class with brutal and abhorrent conditions, they came to this country believing what their fellow countrymen believed: America’s streets were paved with gold. The truth revealed itself to be less than a fairy tale. Most immigrants, Italian or otherwise, spent their time in cramped housing, fighting poverty, and working only the dangerous or repetitive manual labor jobs they were qualified for – if they weren’t the targets of racism or discrimination that shut them out of honest work. The luck factor for my family was different than mine – they worked and toiled in factory jobs long and hard enough to realize they had buried within them an entrepreneurial spirit, and developed it into successful restaurants: a legacy that allowed us “kids” to work, setting up our own idea of making it happen here. Looking back, the rewards and accolades of my working life aren’t remotely possible without the complete, complex concept of la famiglia – the luck I experienced having a family that cared so much, to take the time to mold and set the path for their next generation, and subsequent generations to follow. For that, and our ability to travel so easily as a result, I couldn’t be more grateful. Leaving for the airport to look forward to nearly a full day of travel home is a bittersweet experience. We’re eager to walk through our back door once again, to see family and friends – but we’re hopeful to bring back some of the sunshine and warmth with us, that we don’t leave it completely behind. One of our stops on the flight home was to be in Charlotte, once back in the states. The turnaround, only a half hour to begin with, was threatened with a weather forecast filled with thunderstorms. Our good fortune on this trip included a family connection that works for American Airlines, who offered to help re-book our destination to fly home from Miami to LaGuardia in New York. Once we boarded, a first class flight attendant glided to our economy seats to deliver two glasses of champagne – in celebration of my mid-50s birthday which would be spent in the air, in terminals, in New York City traffic. Toasting my birthday with the free bubbly would have been more than appropriate – as would have toasting another international trip, or a family member who dedicated himself to getting us home safe, and on time. The perfect toast, in my mind, now sounds totally different. A glass raised to the end of another voyage, feeling an ultimate gratitude for that very first fantastic voyage. Like this article? Please share on your favorite social media channel. Or better yet… read some more, with the related content below. To be notified of future posts, please enter your email in the space provided along the right sidebar. And… leave a comment! We love reading them! In case you lived under a rock during the late 80’s, the song by that name became the first a cappella tune to reach number one status on the old school Hot 100 chart in this country. Performed by artist Bobby McFerrin, it flooded American airwaves, and by chance, the old transistor radio in my grandmother’s kitchen. To say that she liked the song would be an understatement, singing along with every opportunity when it played, and often repeating the mantra when it didn’t. Don’t worry. Be happy. Even before the song became a common listen, she seemed to have it as a life rule that she followed without question. “Nonna” didn’t discover the concept of being happy first (before looking for stuff to make you happy), but no one exemplified this rule more than my grandmother. Create the life you want with hard work – It’s pretty official: from conversations, both online and off, that I’ve had or overheard with other Italian Americans, the consensus is in – we can all learn from the unreal work ethic of the generation(s) before us. Truth be told, I’m a touch embarrassed by the way I work these days in my little office cubicle – it’s nothing like the schedules from the past, where I would put in a punishing number of hours just to keep up with my parents, or my grandparents. I’m still astonished by the hours they kept, to provide for themselves and their family. They worked. They didn’t need to be entertained. And they would make many sacrifices of their own time to help those who needed it. The present moment? It’s all that you’ve got – One of her favorite quotes was, “It’s later than you think.” I’d like to think it was her way of saying the future is coming, but it’s length and quality is an unknown. The past is nice to visit, but don’t dwell on it. This is a talent that seems to be lost in our modern days, as we all make our big plans in the coming months, or years – rather than focus on being happy right now, in the present moment. Is there really any guarantee of the future? Be relentless – The default option for most people is to sit back, waiting for life to happen to them. Instead of learning and improving themselves, they keep plodding along, wondering why things never change. I’ve written here before about my grandfather’s relentless nature, comparing him to the champion boxer who always moved forward with constant action, throwing punches, never relenting – always on the offense. He, and his wife of 66 years, were an inspiration on this front. They consistently pursued, over decades, what they wanted – success and inclusion for their family in this new country, their new home. They captured a true secret of happiness, or purpose: know what you want, and never cease in your journey to achieve it. Create meaningful, memorable moments – A particular trait in the Italian American household is creating traditions from what other folks may consider mundane – taking every day moments and making them unforgettable. My grandmother was a master of taking a pedestrian (for her) chore of making meatballs and turning it into an event to be remembered years later. The eating of the food she cooked made the moments even more transcendent: and it’s not just me – other family members, old and younger, can recall vivid details of visits in the kitchen, and the setting of a Sunday dinner table. The little family picnics, cups of coffee at the table, the unexpected “drop in” (everybody loved the drop in back then) of a family member or close friend – they were all memorable moments made so by the enthusiasm for life that I was brought up with. Don’t try to keep up with the Joneses – Jealousy and envy are incompatible with happiness, so if you’re constantly comparing yourself with others, it’s time to stop. Everyone’s experience is different. What looks to be all shiny and bright to the outside world could have been riddled with bumps, bruises, and obstacles along the way. No matter what type of success you see or perceive, you can be sure of that. The immigrants from my past rarely spoke in envious tones. If they were jealous of someone else’s possessions, it was probably the fact that the other party had more food (or god forbid, better food) in a celebratory spread. Or perhaps, nicer linens on a dinner table. My grandmother would make 90 to 100 meatballs at a clip, just to make sure she wasn’t outdone by a friend or neighbor. They were hard working people who had little time to concern themselves with what others had – even if they were at all interested. My grandmother thrived on living a simple life, with few extravagances but many relationships to keep cultivating. Her one luxury was a fur coat she would proudly wear to Sunday Mass during the chillier weather. We’d all be a little happier if we avoided the comparison trap. It’s one of the most important lessons that I’ve been taught. Stay positive in a negative world – I really don’t know how they did it. Their lives were physically challenging and, at times, emotionally apocalyptic with deaths of family members well before their time. I rarely saw my grandmother in a sad, melancholy mood. Especially in the kitchen. Smiling, singing, dancing, stirring, tending the oven – she seemed to be uplifted all of time. I have no doubt her faith in God was part of this. If you had negativity or troubles in your life – well, that steaming cup of coffee and a table side chat when you visited would soon be the focus, and the remedy. Don’t get distracted – I recently attended the funeral service of the mother of a dear friend of mine. While giving a eulogy at her graveside, my friend implored those standing in the cemetery to be more connected – but in a more human, dare I say old fashioned, way of ditching constant social media and showing up with a phone call or visit. Look, we’re all guilty of the zombie-like obsession with our phones and devices – myself included. And I think the social is a fantastic way to communicate and keep up with family and friends (as long as you refrain from diving into the deep end of negativity). My trick is to supplement that, getting a kick out of sneaking in a phone call or text in addition to Facebook comments. It’s way more fun to talk to Uncle Tony or cousin Frankie than it is to just click the “like” button. We all need more of that – again, myself included. My grandmother knew the secret – if she was happy (or at least acted happy), everyone around her couldn’t but help to be happy as well. Her attitude was infectious. She was the life of the party wherever she went, loving to socialize whenever she had the time. You have to remember, her work schedule, whether for family or her restaurants, didn’t allow for much leisure time – but when she had it, made good use of it. The impromptu party or picnic was frequently on her radar – and her grandson has picked up on this as well. I wasn’t what you would call “super sociable” by any stretch back in the day, being just as comfortable with alone time as I was hanging with friends. This was solved by getting married to the (perfect) woman I’ve nicknamed Suzie Satellite for her uncanny ability to throw the perfect party or turn complete strangers into friends within the hour. Now it’s rubbed off on me, as I’m more likely to approach new faces as easily as lurking around the outskirts of a room, just observing. You need time with me? You’ll have to talk to Suzie – otherwise known as my cruise director or booking agent. In the end, one little Sicilian immigrant knew the secret to be, and be happy: to believe that everything works itself out. To not take yourself (or others) so seriously. To know how to laugh, situation appropriate or not. To avoid really negative chatter, and to lighten up the world and those around you at every opportunity. And to have faith that you have a special offering, regardless of the inner voices or outside forces. Like this article? Please share on your favorite social media channel. Or better yet… read some more, with the related content below. Leave a comment if you enjoyed this post. Rolling over bleary eyed in the bed that I slept in at my Nonna’s house, those would be the words that I would first hear, early on a Saturday morning. The source of the noise would be my Aunt Maria, shouting my grandmother’s name as she burst through the front door. It was her Saturday greeting, and it would always wake me up. As I cleared my head, the smell would hit me, the reason my Aunt came over in the first place. The combination of frying meat, onion, and garlic. I’d jump out of bed and quickly descend the stairs to the beat of the sizzling frying pan. Still in my pajamas, I would stand patiently in the kitchen, waiting for Nonna to make the offering: my early breakfast treat of a freshly made meatball, straight out of the pan. This image remains prevalent in my mind some forty years later, as I cook meatballs in my own kitchen. Over time, my involvement with the meatball went from taking the sample in my pajamas, to preparation and cooking stages. As I grew, Nonna would allow me to mix the meat with my hands, form the balls, and taste the first ones before we continued. Every once in a while, she would let me cook one. To get the feel for the hot spots in the pan, and to know when to roll them as one side began to form a crust. As she grew older, cooking 90 to 100 meatballs at a time began to fatigue her, and she eventually just had to sit and supervise. It was then I took control of the pan. The torch had been passed. Now that she is no longer with us, it’s my responsibility to ensure the meatball remains a staple of my family’s diet. Like her, I was a traditionalist with meatballs, pairing them with pasta, simmering them in tomato sauce along side braciole and pork. I learned from my Nonna’s sister the joys of meatball experimentation, serving them as their own course, and using a different sauce than the ubiquitous tomato variety. Her sauce was a savory mixture of bacon, onion, and white wine, and is now my favorite way to eat a meatball. It’s a simple recipe, easy to simmer in a crock pot and a big hit at dinner parties as well. Enjoy! Crumble the beef into a mixing bowl. Sprinkle the breadcrumbs, grated cheese, parsley and garlic over the meat. Beat the eggs with the salt and pepper in a small bowl until blended, then pour over the meat mixture. 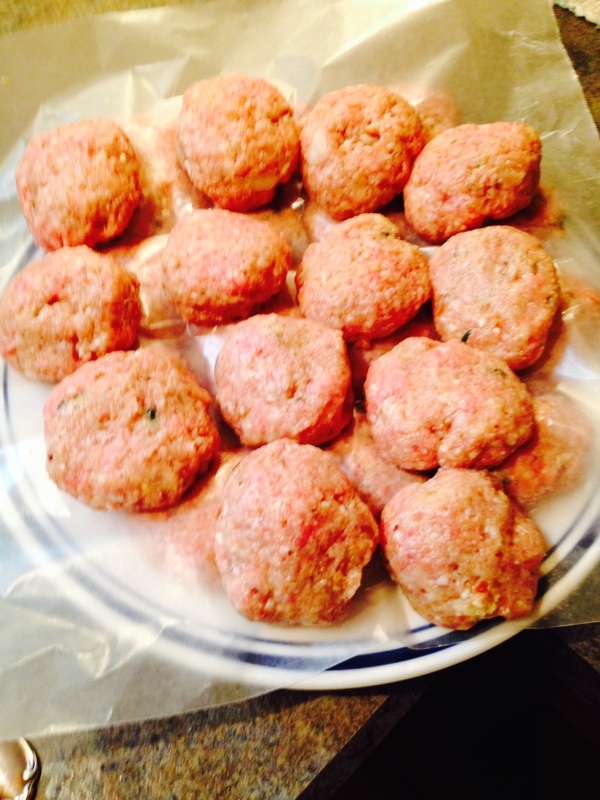 Mix the ingredients with clean hands just until evenly blended, and shape the meat mixture into 1 ½-inch balls. Heat the vegetable oil in a large, heavy skillet over medium-high heat. 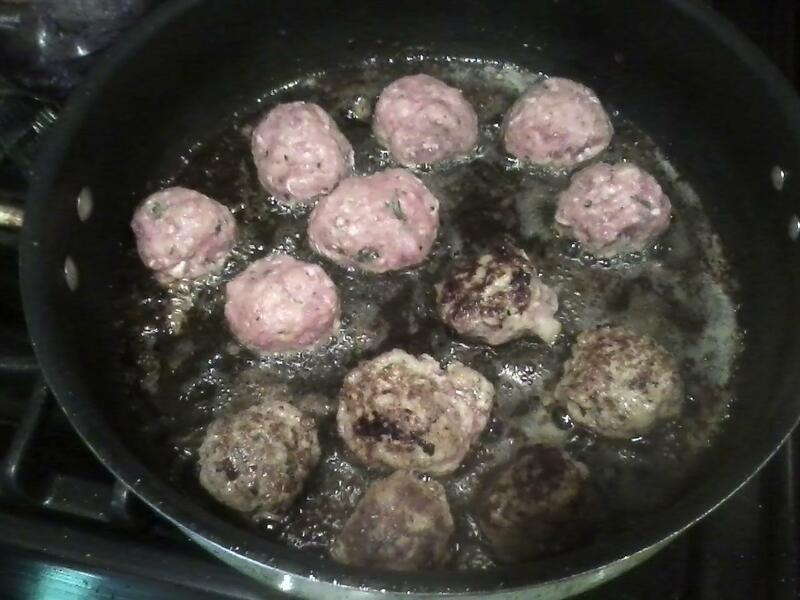 Put as many meatballs into the skillet as will fit without crowding. Fry, turning as necessary, until golden brown on all sides, about 6 minutes. Adjust the heat as the meatballs cook to prevent them from burning. Remove the meatballs and repeat. Cut the bacon strips into small pieces, about 1/4 inch. Cook in the pan for 3 minutes or until crispy. Remove the bacon from the pan. Slice the onion and cook in the bacon grease until onion is soft and golden, about 10 minutes. Add the bacon back and the wine, put your finished meatballs in the pan, and let simmer for 15 minutes, making sure to spoon some liquid over the meatballs to keep them moist. Serve with a crusty loaf of bread and a hearty red wine. In the life of the middle aged Italian American, there may be no more important Sundays than those on the calendar now. Palm Sunday, which was last week, is a major league event as Mass includes the Passion of our Lord Jesus Christ. It’s a reading that details the crucifixion of Jesus, and is a prelude to the Mother of all Sundays, coming up this week – Easter Sunday. While the religious connections remain important to those of us with “traditional” mindsets, the connection that may be accepted universally is the significance of the food at these important weekend holidays. If you paid attention to the last post, you read details on how to build the perfect Sunday dinner – Italian style, with a traditional bent or modern flair. If one detail may have stood out, it was this – these meals are high in volume, calories, and activity. Don’t kid yourself. Eating in this manner, notably at holiday time, is not unlike participating in your own athletic event. Eating at this stage isn’t just about providing sustenance. It’s also about impressing your family and making the people that prepared the meal as happy as possible. The biggest compliment I could ever give my Gram was to eat as much as I could without passing out. To do that, you need to approach the meal with a different mindset. You need to prepare yourself mentally as well as physically. You may even need to play an inspirational song or two. You are an athlete. To take down more than your share of an Easter lasagna (as an opening course, no less!) is an extreme physical event. It could compare to what Michael Phelps or Usain Bolt do to win the gold. The difference between you and them, however, is they do little else on event day. Just concentrate on the monumental task at hand. And that’s something we could all learn to do. Luckily for you, I already have helpful tips on spending your Sundays thinking about eating, preparing to eat, and finally, the actual act of eating – and cutting out the rest. I hope they help you enjoy a relaxing and calorie filled meal with family and/or friends, holiday or not. Ironically enough, to prepare for holiday eating, no other athletic events are allowed. No flag football games. No tennis. The 5K should be shelved. No rounds of golf with the boys. These are physical in nature, and will strip vital energy that needs to be conserved for the eating process. Participation in any of these should be limited. However, it is a Sunday tradition to watch athletic events. In fact, it may be mandatory to watch the football game before catching a well earned nap. Always feel free to indulge in this activity. In the same category, you should probably consider limiting physical exercise. No going to the gym, heavy lifting, running, pick up basketball, or chasing your dog. There’s time enough for this stuff during the week. As has been said, Sunday should be a day of rest. I will, on occasion, break this rule to play catch with my son. But that’s it. There should be no recreational shopping on Sunday. For men or women. Walking through the malls and flipping through the racks at Macy’s saps strength and stamina necessary to repeatedly lift your fork and knife. Refrain from this activity. You’ll save money, to boot. Lastly, there should be no working around the house on Sunday. No pounding nails, no driving screws, no cleaning your car. Put the paint brush down. No brooms, hoses, power washers, power saws – nothing. And no mowing the lawn. Going into your backyard is OK – if you want to walk around a little, look at the trees, pick up a couple of branches off the ground. Even picking some basil or parsley out of your garden. Very acceptable. Just no breaking a massive sweat pushing a mower around ahead of Sunday dinner. Your will to put away “maximum macaroni” will be compromised. As you can see from the above, sweating and exertion is not recommended. If you can avoid this, you’ll be fresh as a daisy when you sit at the dining room or kitchen table, ready to tackle a big meal with people you love on the most relaxing day of the week. As far as traditions go, it’s right on top of my list. How about yours? Now, pass me the grated cheese. Please. Take an informal poll of people that you know, and ask them what their favorite day of the week is, the answer would almost always be Friday. The start of the weekend, you get to abandon your unfulfilling job for at least two days, and the opportunity is there to hang with your friends. In an Italian American household, however, you may be surprised to hear a different answer. Our favorite day of the week is rarely Friday. The chosen day for many families around the country is Sunday. These days, my Sunday routine revolves around going to an early Mass at St. Anthony’s Church with my Dad, and then making a quick trip to my cousin’s apartment to attend what we commonly refer to as “The Breakfast Bunch”. Weekly attendance includes mainly cousins from my Grandmother’s side of the family, and it’s an informal gathering where we’ll have toast, coffee, baked goods, and shoot the breeze. Sometimes there will be an egg casserole or two. It’s one of the best parts of my week not only because of the social aspect, but also for the memories it triggers of days gone by – of the fantastic Sundays of my youth. My Godmother passed away a couple of years ago, and my Nonna has been gone for four years this January. As they were both in deteriorating health the last few years of their lives, it’s been a struggle to keep the flames of Sunday dinner traditions burning. I still make a pot of Sunday Sauce at least every couple of weeks, and I’ll have a dinner with my wife and kids featuring the same food I had as a child. It’s just minus the massive crowds, and the jostling around the 14th Street dining room table that we used to gather around. When I was young, I was at my Grandparent’s house for the entire weekend. Sunday was the fantastic finish. I would be there long before the aunts, uncles, and cousins showed up. Not only would I get a sneak peek at what was going to be served, I might also get a freshly pan fried meatball, or a piece of Italian bread dunked into the tomato sauce that was simmering all day. More or less, it was the same menu every Sunday with a twist here and there. 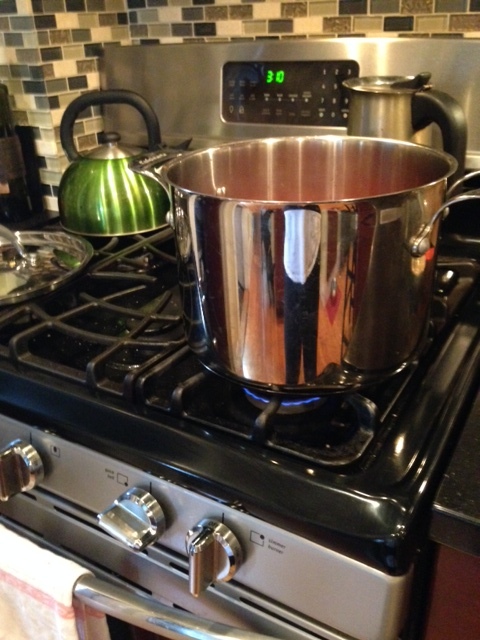 If it was Easter Sunday – well, that was the day the gigantic pan of homemade lasagna was broken out. If manicotti was made at my family’s restaurant that week (and didn’t sell out), that may have spilled into Sunday as well. Regardless of what was featured on the table, it was always delicious, and there was always plenty to go around. My little Sicilians were expert cooks, and their Sunday Sauce was second to none. The preparation of dinner was a process as well. Timing needed to be considered, as we usually sat at table in the early afternoon. Prepping was done as early as the day before, and Nonna would be in the kitchen for hours on Sunday. There’s a right way to do Sunday, and each menu item has the proper order in which it’s served. My grandparents’ end of the week dinners were always old-school, but just for kicks we like to take things to a modern level on certain Sundays. Both ways are eminently enjoyable, and you can be as formal or informal as you like. But as far as the old-school way is concerned, there was nothing better. In my house, we’re pretty good cooks – but those Sundays from twenty or even thirty years ago provide a boatload of cherished memories. Old School: Appetizers? Really? With the tonnage of food that hit the table for dinner when I was a kid, appetizers were not required. We would have more than enough, believe me. But I was always an expert at sneaking the aforementioned meatball before dinner, so that could count as an app. Score. Modern Take: We can get really fancy here – we’ve done calamari, stuffed mushrooms, clams casino, mussels in broth. I’ll stop right there. Getting hungry just typing it. No pun intended, but the world is your oyster when it comes to appetizers. Old School: In my world, the pasta course is ubiquitous. My Grandmother’s choice was almost always a spaghetti or ziti, dressed with a tomato sauce that had been cooking for hours. Special occasions brought out the 10,000 calorie baked pasta dishes. Unbelievable. Modern Take: We’ll still take it old school style here, but we often change the shape – ravioli, rigatoni, tagliatelle, among others. The sauces can change, too, although the Sunday variety is still my favorite. Oil and garlic, bolognese, and a variety of light cream sauces are new traditions that have hit our table. 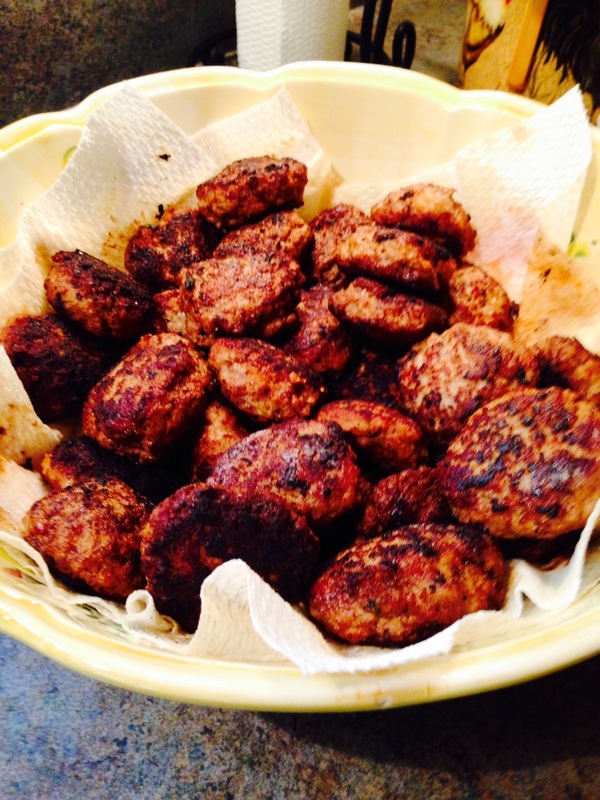 Old School: In those days, the meat was meatballs front and center, and sausage or braciole. That’s it. And in the end, that’s all we needed. Modern Take: We’re not doing quail or Cornish game hen here (that’s really fancy), but in my house we like chicken cutlets, braised short ribs, and my wife loves to roast a whole chicken on any given Sunday. Osso Bucco is something on my radar to try soon, as well. Old School: The salad was always eaten last at the table on 14th Street, used as a palate cleanser. It was iceberg lettuce, dressed with olive oil and red wine vinegar. Very simple, and although it may not sound good to you, I thought it was excellent. Modern Take: Like the apps, you can go many different ways here, and we have – Caesar salad, salads with walnuts and cranberries, avocado, with chick peas and beans, with balsamic glaze and other fancy dressings. And we rarely use iceberg for anything – it’s romaine, spinach, or mixed greens. Again, unnecessarily fancy. But so very good. Old School: With the calorie meter obliterated already, dessert was still on the way, but here’s where the Sicilians threw their twist in and decided now we should eat healthy – by giving us nuts and fruit. My Grandmother would roast chestnuts or crack walnuts, and my Grandfather would peel and eat multiple pears, his favorite. I also remember Italian cookies, and the ladies were fond of sponge cake. Drinks included water, soda, and a simple red table wine. Espresso at the end. Modern Take: I’m already thinking about grabbing tiramisu from the local bakery for the next Sunday dinner. My wife will bake cakes and make other desserts (we call one of our favorites “chocolate crack” for its addictive qualities), and her mother is a great pie maker. Drinks have run the gamut- mixed cocktails, sparkling water, red wine, white, craft beers. Very fancy. As my Grandmother’s age crept into her 90’s, she couldn’t host the big dinners anymore, on Sunday or any other night. I took over the meatball making chores for her on Saturdays, and on the following Sundays a smaller group of our family would show up for a little brunch. Nothing too over the top. Scrambled eggs, some meatballs with sauce, Italian bread. Strong, stove brewed coffee. Sponge cake. Seated in the kitchen instead of the vast dining room table. Those Sundays were special, too. My kids grew up around that kitchen table, having their first servings of spaghetti in their high chairs, in the house on the street that I grew up on. Those days are sorely missed. And with our “Breakfast Bunch” gatherings now, we try to recreate that special feeling of family ties that were their strongest, so many years ago. When Sunday was, without question, the favorite day of the week. What’s your story? Have a favorite day? Or tradition that you’d like to share? Leave your comment below.